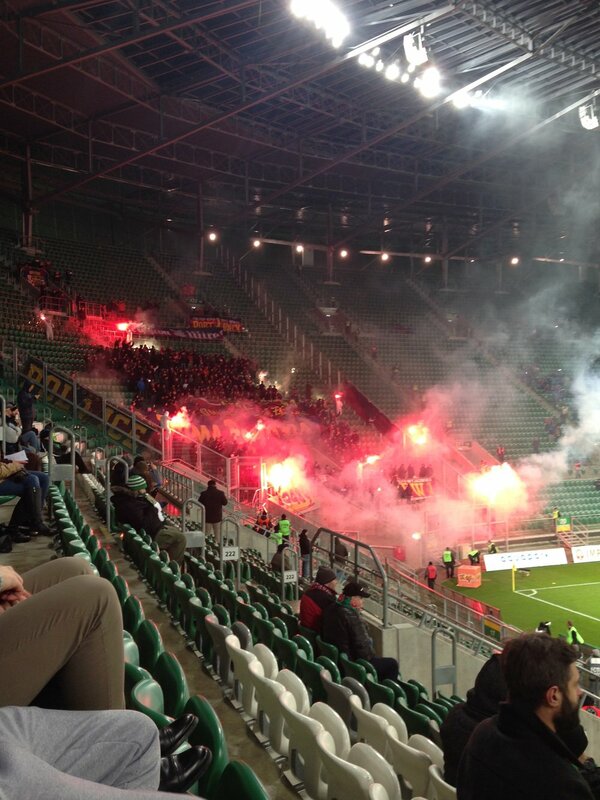 28th November 2015 - Ekstraklasa (Tier 1) Slask Wroclaw 0-0 Pogon Szczecin - Attendance, 5,628. On a bitterly cold night in Poland we spent our Saturday evening watching probably the worst game of football we'd ever witnessed, (either in person or on TV). It should have come as no surprise really as the opposition that night would go on to draw more than 50% of their league games that season, and Slask Wroclaw would struggle all season to score many goals or threaten to get anywhere near the top half of the table. We were there though to cheer on the one English player playing in the Polish top flight at that time, a certain Mr Tom Hateley (son of England legend in the 80's and early 90's, Mark). Whilst clearly not of the calibre of his father, he did sit comfortably at the base of the midfield, keeping the game ticking over with some neatly sprayed passes to the left and right. I'm not exaggerating, that is literally all that happened in this game. In contrast to what was occurring on the pitch, the stadium was absolutely stunning. Sadly, since it hosted Group A games in Euro 2012 it has been taken on by a team that struggles to attract more than 8,000 fans a week, and numbers were down even further on that figure due probably to the low temperatures as much as the recent form of the home team. Pete would return alone to Poland in 2016 and become a keen follower of the team over a 3 month period, sadly to discover that this inept performance from Slask Wroclaw was not a one off, as week after week they struggled to perform.